Thai flag (ธงชาติไทย /tong châad tai/) shows five horizontal stripes in the colors red , white, dark blue, white and red, with the middle dark blue stripe being twice as wide as each of the other four. Red color is stand for ‘nation’ (ชาติ), the color of blood and represents life to the Thai people. White color is stand ‘religion’ (ศาสนา), the purity of the national religion, Buddhism. Blue color is stand for ‘king’ (พระมหากษัตริย์) , the monarchy and the important role it plays in the daily lives of Thai people. 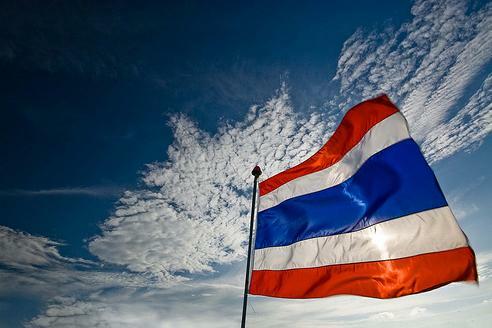 In every Thai school, school students have to stand in rows and line up before the flag pole, show respect to the flag by standing up very straight while singing the Thai national anthem.The Thai flag is hoisted at 8 am sharp. What are the colors of your country’s flag? Do they stand for something? Been following your pages recently and can’t help to scribble these words. 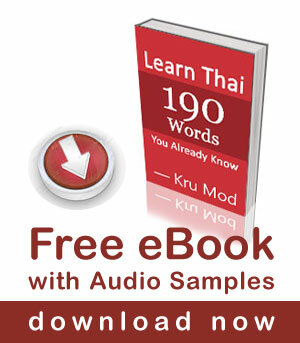 You are not just teaching us Thai language but sharing with us your rich Thai culture as well. I take pleasure learning everything Thai and especially from you. Keep up your good work, we really appreciate your unselfish effort. Thank you very much. we just moved to Thailand and we have been wondering about the national anthem. We would love to learn the words, and what they mean. I know we can google it, but it would be so much fun if you would teach us!